One of the great things about hummus is that you can add so many different flavours to it. 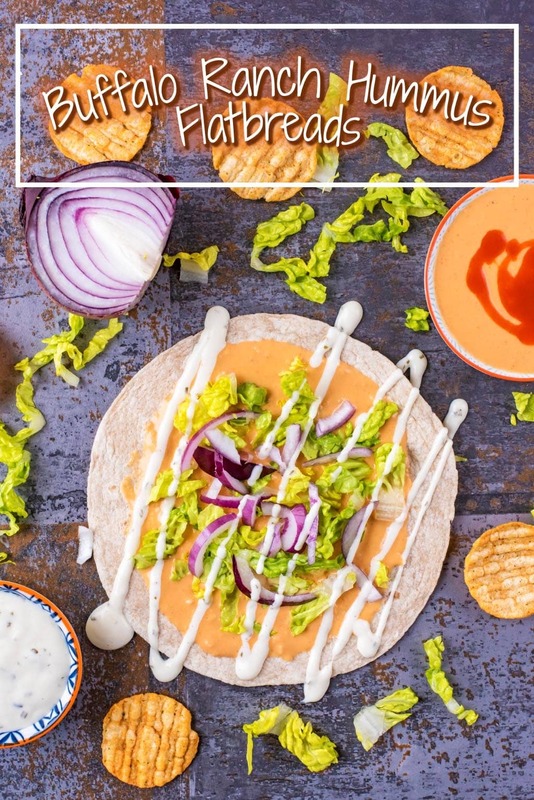 If you are a fan of hot sauce, mix some in to homemade hummus, spread it on to a flatbread and top with some salad and a drizzle of our homemade healthier ranch sauce for an exciting lunchtime option. 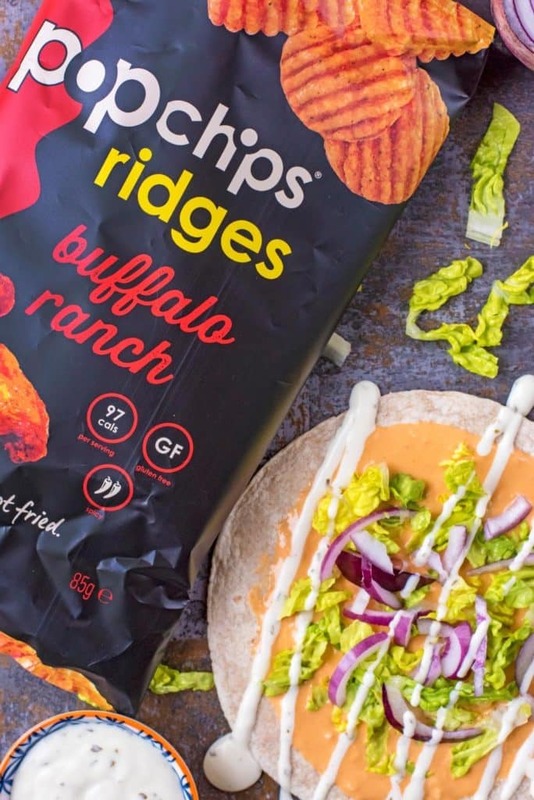 These Buffalo Ranch Hummus Flatbreads are best enjoyed with a bag of Popchips so you can ‘Enjoy More’ of your lunch break. So…. we are a little hummus obsessed at the moment. 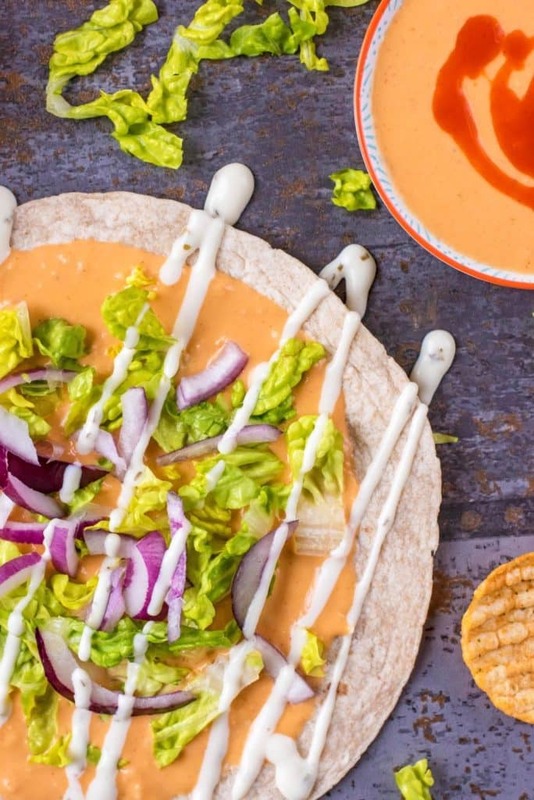 But, what we are more obsessed with is buffalo sauce. It’s the best hot sauce there is and it makes everything taste at least 7 times better (I don’t think that’s an official statistic, but I sounds right). Our obsession with it has led us to find as many ways to eat it as possible, so we mixed it in to some hummus and it basically changed our lives forever. We have Popchips to thank for this creation, as their new lunchtime challenge inspired us to come up with it. 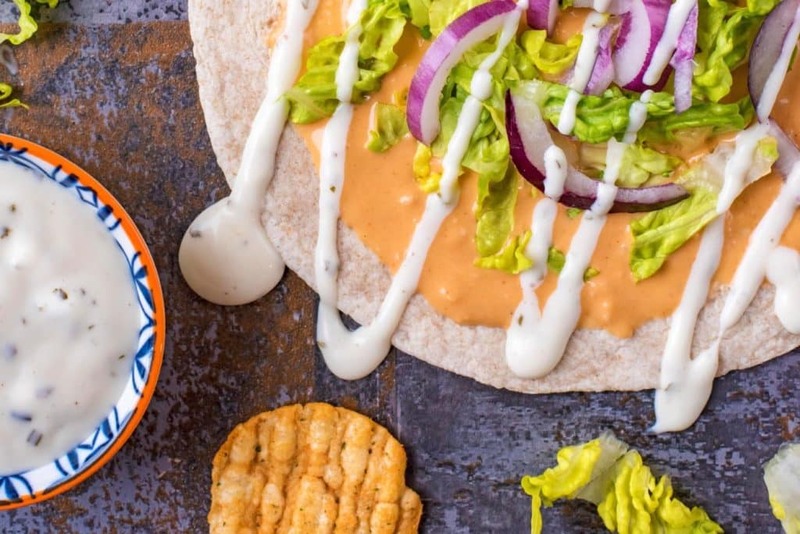 Do you want to be kept up to date on more delicious recipes like these Buffalo Ranch Hummus Flatbreads? Please subscribe to the blog mailing list (it takes 30 seconds). You will get sent the new recipes straight to your inbox. Your email address won’t be passed on to anyone and you will never be spammed. We have been huge fans of Popchips ever since they hit the supermarket shelves (I actually first tried them when I was travelling around the US when they weren’t even in the UK yet) and sometimes a big bag of them is the only thing that gets us through the day. So, when Popchips challenged us to come up with an exciting lunchtime option inspired by one of their flavours, we jumped at the challenge. An opportunity to get creative, and eat loads of Popchips! For research purposes, obviously. We knew it was going to be the Buffalo Ranch flavour we worked with, but the Crazy Hot flavour was a close second. Can you tell that we are a house of hot sauce lovers? What we love about Popchips is that they aren’t deep fried, but popped instead. You get all of the crunch and flavour that you know and love from a crisp, but much lighter! That means we can ‘Enjoy More’, which is what Popchips and this campaign is all about. How are they made? They heat them in a pressurised chamber and then quickly release them so the POP! They then massage them with their favourite spices and seasonings and you have a chip that has all the flavour, and half the fat. Snacking is a big part of our life, and with Popchips we can enjoy a healthier snack time. Crisps and a sandwich is a classic lunchtime combo, but it can get a little boring. Ditch the bland pre-packed supermarket sandwich with an uninspired bag of crisps and get a little creative. 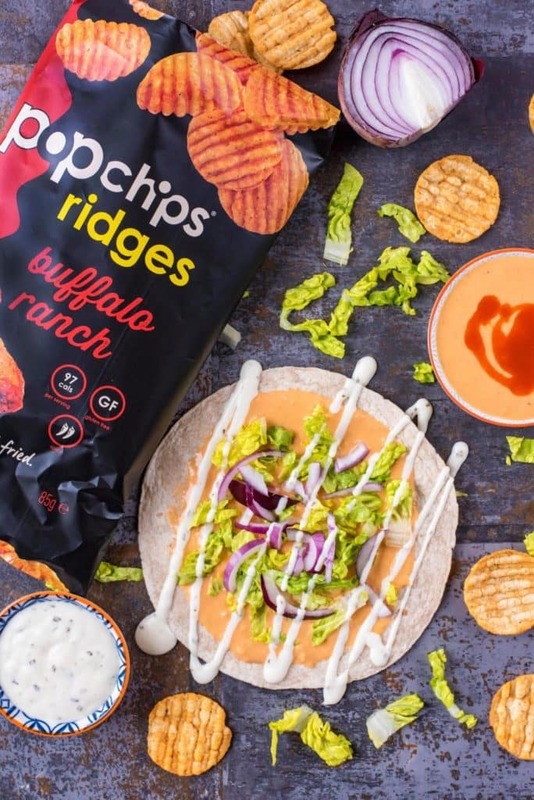 Creative doesn’t have to mean expensive, or time consuming, and these Buffalo Ranch Hummus Flatbreads, inspired by Popchips Buffalo Ranch, are bursting with flavour, but ready in a flash. We are here to help you ‘Pop Your Lunch’ and ‘Enjoy More’ and turn lunchtimes from a routine to something you really look forward to. Knowing you have this waiting for you is definitely going to have you counting down the minutes until lunchtime. You work hard everyday, and lunchtime should be something you look forward to and enjoy. So make yourself this flatbread, grab a bag of Popchips to go with it and settle in to a relaxing and delicious lunchtime. 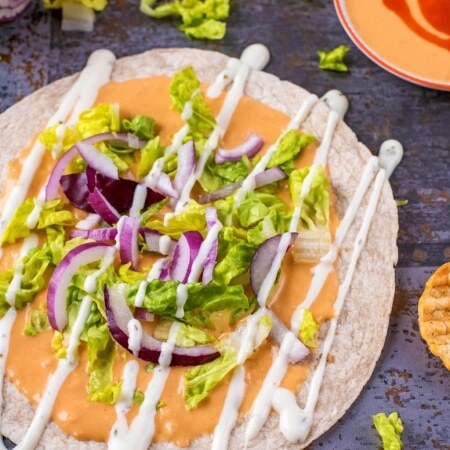 We added plenty of buffalo sauce to this, as we wanted it to have a bit of a kick, but feel free to use less if you aren’t as crazy about hot sauce as we are. The drizzle of homemade ranch dressing does cut through the spiciness and cool it down a bit and buffalo and ranch are a pretty epic flavour combination. Don’t want to eat this on a flatbread? Just throw some hummus in a tub, drizzle it with some ranch and dip some cucumber and carrot sticks in to it. The perfect desk snack that will have your co-workers jealous. 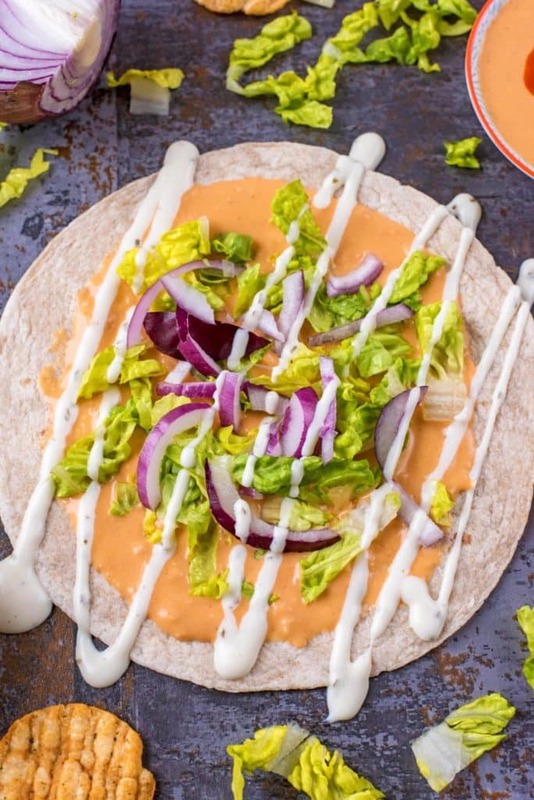 If you are a fan of hot sauce, mix some in to homemade hummus, spread it on to a flatbread and top with some salad and a drizzle of our homemade healthier ranch sauce for an exciting lunchtime option. Add to a blender the chickpeas (and liquid), olive oil, tahini, lemon juice, salt and pepper, garlic and buffalo sauce and blend until smooth. 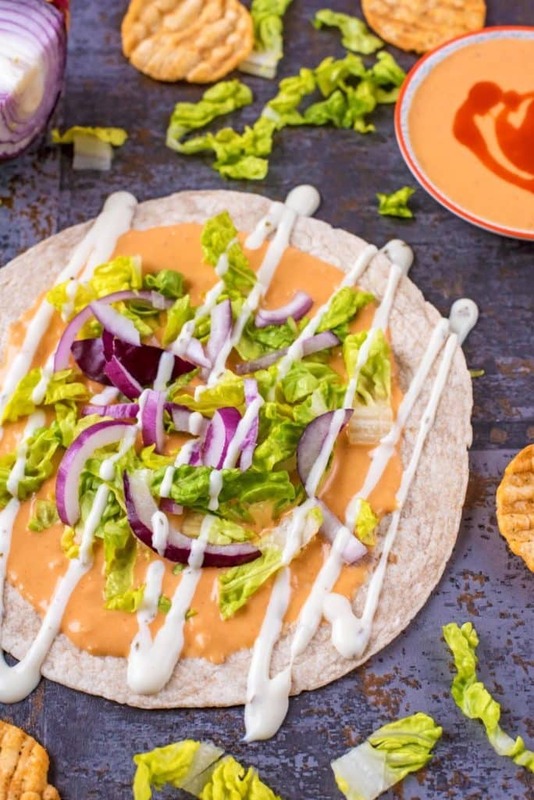 Spread the hummus on 4 flatbreads, top with lettuce, red onion and a drizzle of homemade ranch dressing. Fold up and serve with Popchips. We have other flatbreads for you to try too. Try our Moroccan Chicken Flatbreads, Greek Hummus Flatbreads, Spinach and Tomato Breakfast Flatbread or Hummus and Pomegranate Flatbread. This combo does sound like a yummy and satisfying lunch! More Buffalo for me too! It’s the best. I’m always looking for more hummus flavors to keep my family in a healthy snacking mood! Thanks for the great recipe! Sounds like a delicious hummus recipe, great tip about adding the chips in it! Will make it at our next gathering! Oh!!! I love flatbreads with salad and hot sauce!!! I thought I was the only one. In fact sometimes as a snack I rip my flatbread into bits and just dip it in hot sauce!!! oh this looks super tasty. I love hummus and imagine it would be so good like this! This hummus looks so very delicious and I love the whole serving combination with the pop chips.A lunch that one can look forward to. Oh my goodness that looks so good! I’m a big fan of Popchips too – they’re my go-to evening snack when I’m slimming. So good! That looks so delicious I need to make this! I bet the popchips are great with it, i didn’t know they did that flavour of them.